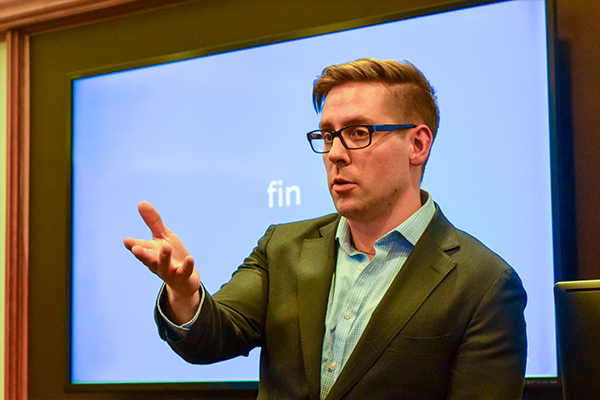 Mischa FisherData can help tackle intractable problems such as healthcare, crime, and unemployment, economist Mischa Fisher said during the Ray and Nancy Loeschner Leadership series lecture at Northwestern University. 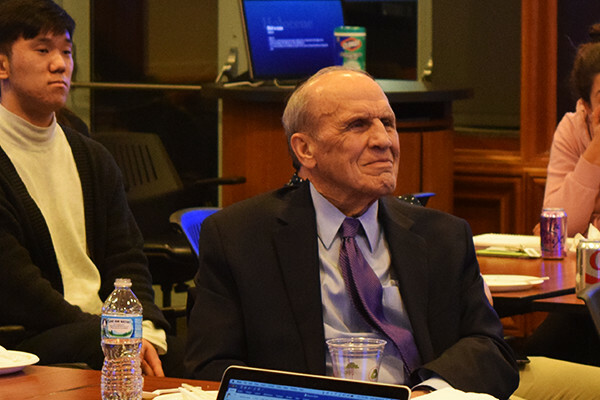 Fisher, chief economic advisor to Illinois Governor Bruce Rauner, discussed many ways data can improve public decision-making and touted the benefits the scientific process in a 90-minute presentation at Northwestern’s School of Education and Social Policy. Fisher was the third speaker in the Loeschner Leadership series, which presents visionary leaders in education and other fields. Wendy Kopp, the founder of Teach for America, helped launch the series in 2013. Eva Moskowitz, CEO of Success Academy Charter Schools, spoke in 2015. The lecture was established with a gift from SESP alumnus Ray Loeschner (MA57) of Grand Rapids, Michigan, the former president of Olivet University and a trailblazer in higher education. Loeschner (pictured below) also received his PhD from Northwestern in 1962 and served as an assistant football and track coach. “Developing leadership in all walks of life is what Northwestern does best,” said Loeschner, who attended the event with his daughter, Amy Keane, and was introduced by SESP Dean David Figlio. Fisher, an expert in data-driven policymaking, emphasized the ways data can help formulate better questions to get more meaningful answers. It also can provide a path to compromise, he said. But like every tool, data is a mixed bag. “Don’t take anything at face value. You can always poke holes in things,” Fisher said. “A complete look at something requires understanding the absolutes, trends, deviations, and rates. The world is a complex place. Fisher encouraged students to enter the public sphere where he said they can truly make an impact. Most people in public policy have good intentions, he said, and data can help illuminate their efforts. Ayah Kamel, a doctoral student in the Human Development and Social Policy program, said she appreciated the chance to hear how a senior-level government official is thinking about quantitative issues. “It makes our research more relevant when people in the policy world are speaking the same language,” she said. Alumnus Chuck Friedman (BS88), senior vice president at Microsoft, will speak at the next Loeschner Leadership Series lecture event on April 10, 2018.